​As a nonprofit organization, over 35% of our annual budget comes from donor contributions. 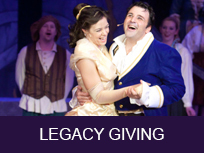 We welcome gifts of any size which help to support our main season productions and our summer youth camps. Contributions from theatre-lovers like you help us keep the magic happening on our stage year-round. Click on the links below to read more about the various ways you can support your local community theatre. And, thank you!